IMG_5778.JPG, originally uploaded by lisabagg. There's so much to say about what Finn's been up to lately. He is not a baby, not yet a man, to paraphrase Britney. (In a better era, that is.) Rather, he is in the developmental phase he declares is a "Big Boy." He does not pass up an opportunity to assert his Big Boy status. If he wants a drink, it must be in a Big Boy cup. If he sits down, it darn well better be in a Big Boy chair. You get the picture. So, Finn? When you read this when you're all grown up, here's what you're up to at Big Boy 28 months. * You pick curious battles to fight. Yesterday, you would not leave the house until I produced a photo of a chicken. Today, you refused to leave the house until I had an entire sheet's worth of heart stickers on my pants. Once you're satisfied with one of these weird requests, you carry on happily. * You tend to give me a harder time that anyone else in your life. No one believes me when I talk about the tantrums you perform for me, where you do a magic trick where all your bones turn to jello and you become a red, snot-spewing, 28-lb. lump on the floor. * Luckily, you are more than cute enough to make up for these tantrums. * You are uncommonly gentle with all animals for a child of your age. You are great with Santos, of course, but you also love petting the neighbors' dogs and cats. You like to make up stories about them, where they visit each other, or that they have baby sisters or brothers, or that they sometimes get time-outs. * You also love babies. There are a couple of babies at daycare and you, again, are so gentle with them for a child of your age. You love watching them grow up--last week, you ran up to me to let me know that Baby Asher is now crawling. You are wonderful at making them laugh--your favorite trick is to pretend to sneeze, which seems to work every time. * While you are the fussiest with me, you are also the most affectionate with me. Lately, you've become my full-on boyfriend. You play with my hair, caress my cheeks, give me a million kisses, and tell me you love me all the time. You and Daddy recently went out and bought me a pair of earrings, and you love it when I wear them. You say, "You like those earrings I got you, Mama?" Let's just say that I eat this up. * Your favorite thing is to lie with me and Daddy in our bed and read stories. You will seriously go through 20 books. You correct us if we miss a page and have an amazing memory for what happens in the stories. As your parents are both book nerds, we hope you continue to love books as you grow up. That's just the tip of the iceberg, Finnie. You are an amazing kid. We are so lucky to be your parents. armand, originally uploaded by lisabagg. 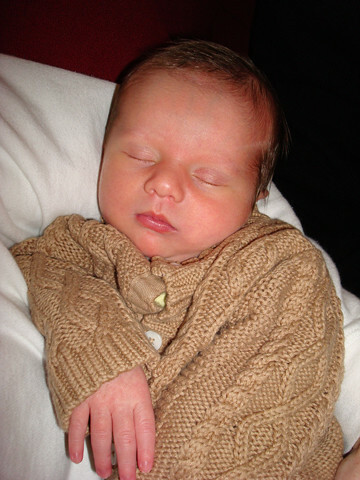 Katie and Wendell welcomed a little boy, Armand, on January 9th. Actually, he's not so little--the guy weighed in at 9 lbs., 11 oz. Dang! 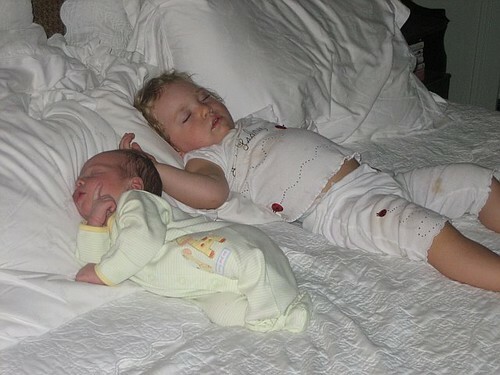 Here he is napping with his big sister, Estelle. Again, dang! He looks like a three-month-old, not a newborn! Congratulations, Katie and Wendell! Welcome to the wonderful world of baby boys. We know you'll love it. IMG_5772.JPG, originally uploaded by lisabagg. ..or two toddlers in a dog bed. band name: the terrible twos? 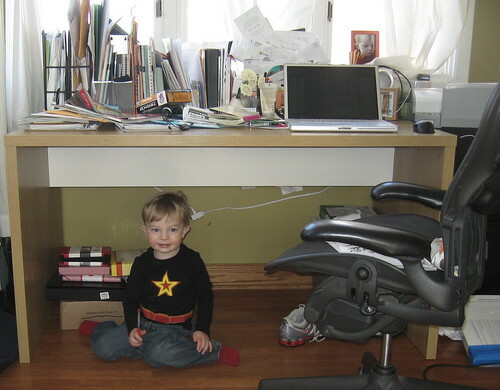 the terrible twos from lisa hazen on Vimeo. It is currently ten degrees in here Chicago. Every single kid I know is sick. Finn is currently recovering from bronchitis. Not only do I wonder how people ever settled this punishing land in the first place, but I'd like to know how they did so without the relief of having Dora the Explorer Tivoed. I mean, we're pretty much housebound at this point. Dora has been around a little more than usual these days. Since Delilah and Finn both had bronchitis, Cassie (Lilah's mom) and I figured that, hey! Misery loves company. We're going nuts with these sick kids in the house, let's get them together. Here they are with a rendition of the alphabet song. Yes, I let them bang away for an hour to burn off some energy. I even let Finn finger paint this weekend, which should indicate how desperate I am for appropriate activities to appeal to the two-year-old mind. IMG_5767.JPG, originally uploaded by lisabagg. 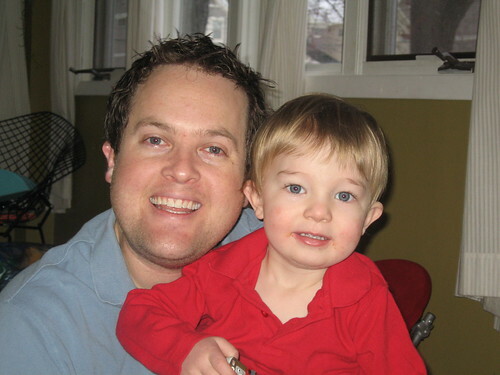 From this photo, it would appear that I did not pass along any genetic material whatsoever to Finn. He totally looks like Shawn in miniature. I mean, right down to the ears! IMG_5760.JPG, originally uploaded by lisabagg. 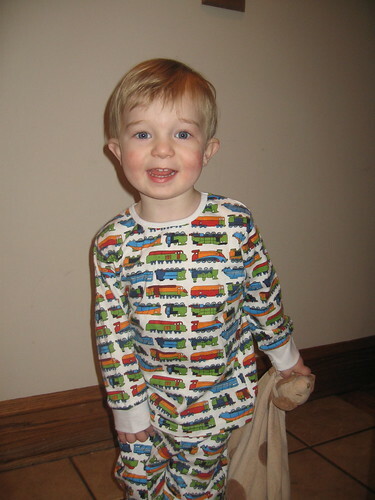 Here's Finnie wearing the train jammies that Nana got him for Christmas. And he's even holding his little lovey--his "night-night." 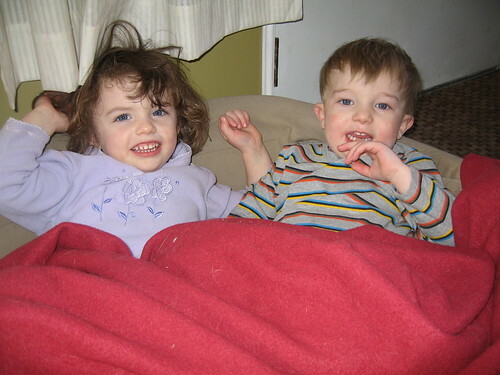 I mean, how can there be wars in this world when there are two-year-olds in train jammies with their favorite blankie? A basket of kittens has nothing on Finn. What a happy little guy he is. Except when he's not. And when he's not, you're in for it. My advice: duck. But the ratio of gleeful, adorable, delightful, giggling boy to a pint-size version of a belligerent Chris Matthews (so shouty!) is mercifully about 9:1 at this point. You never know what will set him off. The other day he wept for 20 minutes because I put a straw in his juice. Another time, I joined in when he sang his A B Cs. But let me tell you that that's a ratio you can happily live with when the ratio is stacked so adorably in your favor. Heck, I'd even take these little moments if the ratio was reversed. He's that cute. IMG_5616.JPG, originally uploaded by lisabagg. 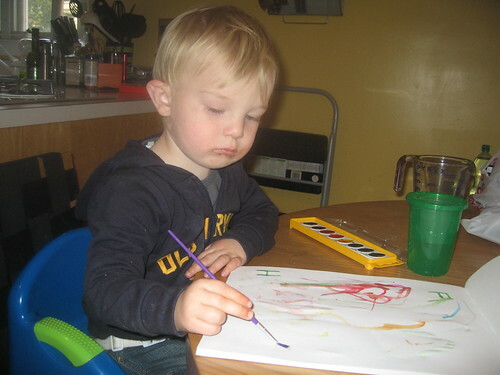 Finn has really been into doing crafts, painting and coloring these days. This weekend, he and Daddy disappeared downstairs for a while and created a bunch of paintings for everyone in the house. One that was posted next to my desk for me, one posted at Santos' eye level on the wall for him, and one on the bulletin board for "Finnie and Daddy." It's adorable when he shares his work with you. He proudly pointed to all the things he had drawn on mine ("That's Santos, Mama! That's a train!") and the stickers he used ("You like stars!") And he always checks to make sure I have his picture next to my desk. He'll ask, "You like your picture I made for you?" I do. On New Year's Day, we woke up to a ton of snow. There was little better way to usher in the new year than by taking Finn sledding with his friend, Lilah, and all of her sisters. Lilah's dad, Brian, picked us up in their van and we headed for the local sledding "hill." Wow. I grew up in Pittsburgh where the hills were a thrilling, irresistible thrill ride. Both my brother and I still sport scars from sledding accidents. This barely qualified as a "slight grade." At least it was appropriate for young kids. Finn had a blast. We parked him on a two-man sled with Lilah, then sent them sailing down the hill together. It was quite a workout, since we ended up pulling them back up the hill afterwards. It was a sign of a good sledding day that Finn and the girls got so exhausted that they were crying and fussing the whole way home. Finn slept four hours that afternoon. He was so cute with his pink little cheeks. It should be noted that as I write this, it is currently 60 degrees. While I am the first person to complain about the winter here, there's something about 60+ degree temperatures in January in Chicago that just ain't right. 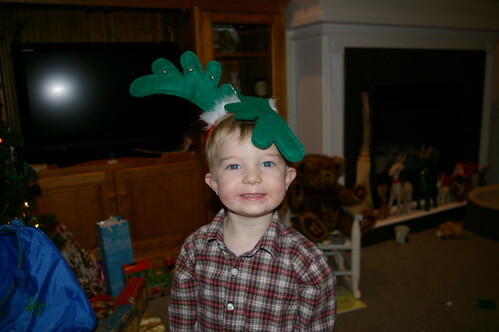 Reindeer, originally uploaded by Daddy Shawn. Daddy: "I love you, Finnie. You're my son." Finn: "And you're my cloud, Daddy." It totally took me a minute to get this, but he thought Daddy said "sun." Further evidence of Finn's creative genius. Nota Bene to everyone on our Christmas Card list: Because we couldn't quite get our act together in time, they are now New Year's cards, and are on their way. Except for a few addresses I need to follow up on. Watch your mail! Asher1wk, originally uploaded by lisabagg. Our dear friends and old neighbors from Oakland, Sarah and Kyle, welcomed their new little baby boy to the world December 22nd. After nearly a month of close calls, Asher took pretty much everyone by surprise when he decided that not only was he arriving that day, he was coming right now. Poor Sarah nearly had little Asher right in her living room. Asher joins his sister Phoebe in the great-looking newborns club. Isn't he a cutie? Those are C-section good looks, even though he was born the old-fashioned way. We just flew back from Seattle (and boy, are our arms tired). We went west to visit with Gramrene, Auntie Julie, and Uncle Mike for Christmas. It was a delightful visit--Finn loved having such an abundance of everyone's undivided attention. We had a surprise 70th birthday party for Gramrene, and I'll let you guess who led the rousing rendition of "Happy Birthday to You..." and helped his Gramrene blow out her candles. Here are some photos we got of the trip, including making cookies with Grandma and a fingerpainting session.